Happy Friday! 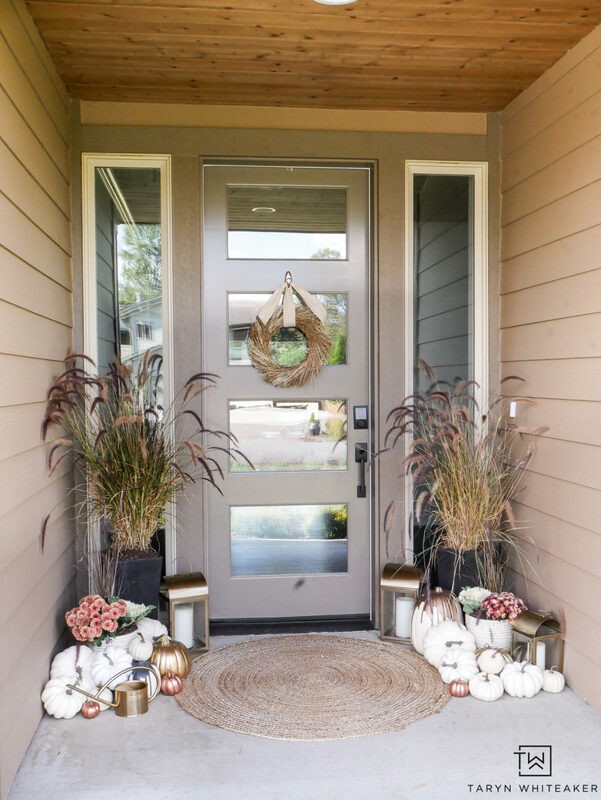 This wasn’t a planned blog post, but I like being casual on Fridays so I thought I’d keep the blog causal too :) I looked out at my porch the other day and realized that I have had three different fall porch designs since September. That may seem a little crazy and overboard, but at the same time it has made sense and I actually didn’t make that many changes to complete the three different looks. I started with our early fall porch, then went into Halloween and now a late fall/Thanksgiving porch. 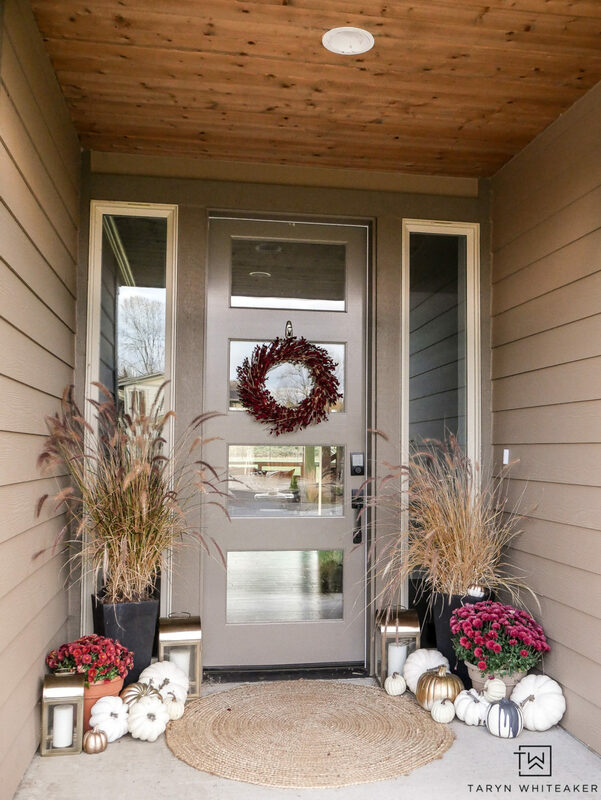 I thought it would be fun to show you how transitioning your fall porch can be super easy! Here is how my porch looks today. At least for a few more weeks until I completely redo it for Christmas! The blush pink tones from our early fall porch faded away (more realistically my pink mums shriveled up), so after I took down our Halloween Porch I brought out these deep Burgundy mums for a little pop of dark earth tones for Thanksgiving. Here is a peek at how my porch started in the beginning of fall. I planted these huge dramatic grasses in tall black pots and placed a neutral jute rug as a door mat. Those were my base items for all three looks. As Halloween approached, I just made a few tweaks to turn it into something a little cute and spooky! 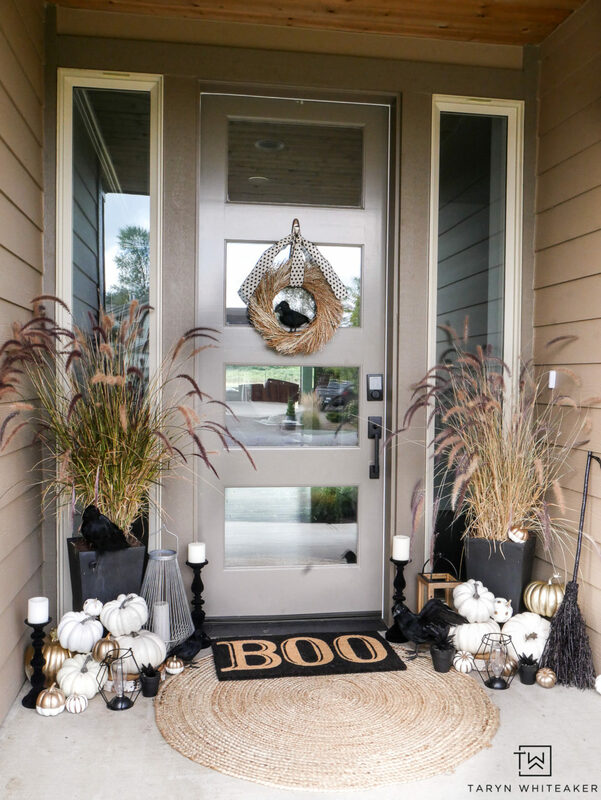 I removed all the pink, added this BOO Door Mat, restocked the pumpkins and added a few other Halloween elements. And in this case I simply added a crow to the existing wreath! But otherwise the base items still stayed the same. Now today, it’s taken on the look of a little more late fall and is all ready for Thanksgiving! I added the red mums and put up a new red pinecone wreath and that is IT! This wreath will actually stay up here for the holidays and a new transition will begin. You’re right – although the base elements were still the same it looks so different with only the few new addings around. It’s amazing what so less new deco changes varies the total look! I like your Halloween porch at most. Certainly because it’s my favourite season ;). It looks all told autumnal, chic and a little spooky!